Need more information about booking Home 7271697 ? Highpoint is a unique, architecturally designed house perched high on the mountain with breathtaking views of both mountains and ocean. A private outdoor Jacuzzi spa offers the perfect way to relax at the end of a day’s activities. Due to its unique configuration the house adapts perfectly for both small and large groups. It is never too big nor too small. 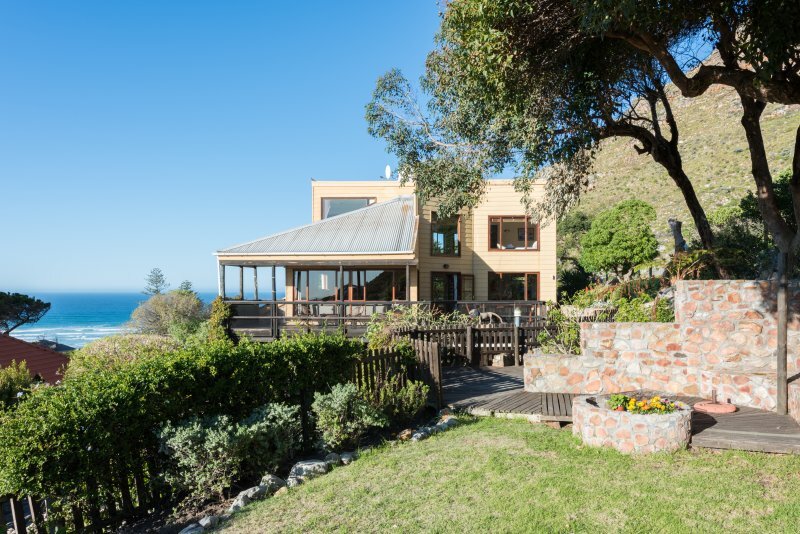 Located on the famous Boyes Drive, the house is just moments away from some of the finest beaches in the Cape, the restaurants, bars and shops of Kalk Bay and the Constantia wine valley. The house is only 20-30 minute drive to the airport, Cape Town, Stellenbosch, Simons Town and the penguins of Boulders Beach. A house perfect for those who want peace and natural beauty but still be close enough to enjoy everything else that Cape Town has to offer. Highpoint has four bedrooms, two double ensuite rooms on the top floor and a room with two single beds and one with a comfortable fold-out sofa on the ground floor. The open plan reception floor offers a friendly hearthside lounge, with a large fireplace, an elegant open-flow dining area with a ten-seater dining table, and a beautiful fully-equipped modern (granite and African mahogany) kitchen. Windows are everywhere with impressive views from each one. A table tennis table in the basement adds to the range of activities on offer. The established terraced garden, substantial decking area and outdoor Jacuzzi spa is perfect for taking in the spectacular views that stretch across False Bay and the mountains behind. Being the highest house on the mountain there is direct, private, access to the mountain’s National Park and hiking trails and is just a 10 minute walk to Muizenberg beach (one of the finest beginner surfing “breaks” in Africa). There is plenty of secure off-street parking at the top of a steep driveway (although not suited to people carriers). The house comes complete with alarm, security and remote operated driveway gate. Miles of open sandy beaches, mountains plunging into the sea, small fishing harbours, restaurants, bars, markets and a host of outdoor activities to keep you busy. Muizenberg is often overlooked in favour of its more “trendy” neighbour Kalk Bay. Yet this ensures the village has retained its quieter and more relaxed atmosphere while still being only a five minute drive from Kalk Bay. Muizenberg has also become a haven for artists and other artisans with many studios now dotted around the ‘Old Village’. It is also a mecca for surfers, longboarders, paddle skiers, sailors and kite surfers, attracted by the extensive water sport opportunities on offer. And Muizenberg also has its share of restaurants, bars, cafes and shops that equal those in Kalk Bay. There is no shortage of things to do for those who like to stay a little off the beaten track. Come live on the mountain. Highpoint is located within walking distance of the train station that is directly connected to Cape Town Central. However, to maximise access of the local area, a car is highly recommended. We are on hand, before, during and after the stay to provide information and advice. Smoking is allowed outside. However, due to the high fire risk area, extreme caution is requested in disposing of cigarettes carefully in the rubbish bins.